Review date: 13 July 2003. The chemiluminescent glowstick is somewhat passé, as far as toys go. People who buy them for a reason other than their prettiness, though, still like them just as much. 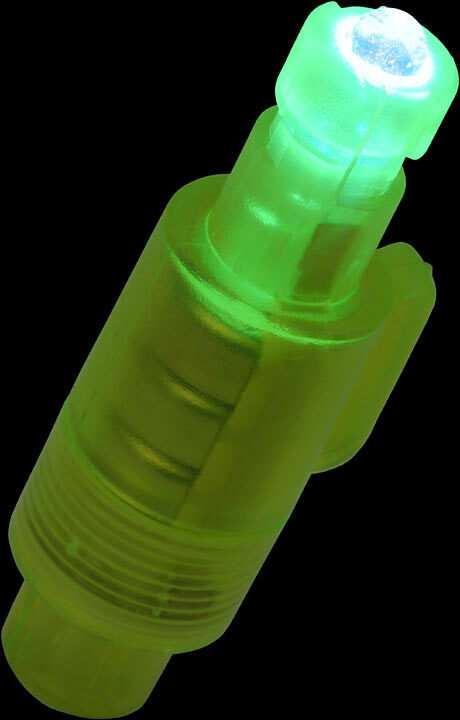 A thing that glows usefully brightly for a long time is bloody handy for anyone who's worried about finding themselves in a storm cellar, cave or deep dive with no other source of light. Chemical glowsticks are also shockproof, EMP-proof, waterproof to quite immense depths, and very safe. They don't make heat, and they can't make sparks. It'd be nice if you could turn glowsticks off, though. You can throw them in the freezer to greatly slow their reaction rate, but carrying around a dewar of liquid nitrogen with "OFF SWITCH" written on the side isn't likely to catch on. Glowsticks also aren't very bright - well, the ones that last more than half an hour aren't - and they don't like humidity. That's why they come in sealed packages that you shouldn't open until you're ready to use the stick. 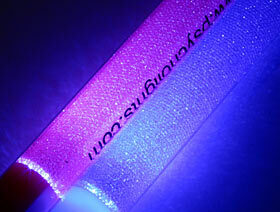 Glowsticks have a limited shelf life, too; about four years, for standard long life sticks. It's possible to make electric lights that behave something like glowsticks, but can be turned off, and which don't care about humidity. They can be brighter, too, in theory at least. Kriana's Krill Electronic Lightstick is an electroluminescent (EL) light that more or less does the job of a glowstick. I talk about EL material in more detail here; it's eminently suitable for forming into sticks, because it's a flexible sheet that can easily be wrapped around a tube, as it is here. 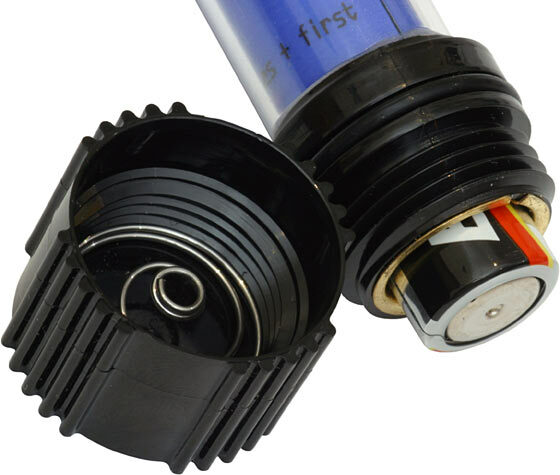 The Krill lights are a cylindrical sandwich with EL material wrapped around a battery bay containing a couple of normal AA cells, and a super-tough polycarbonate tube on the outside. The Krill sticks come in standard EL colours. For review, I got a blue one that lights up blue-green, a greenish-yellow that lights up aquamarine, and a pink one that lights up greenish-white. That last one's the one you want if you want to read maps or do other colour-rendering-dependant tasks; it's not a very clean white, but it's good enough for many purposes. The aquamarine one's the brightest, by a small margin, because aquamarine is the natural light colour of the EL material. ...by twisting the single removable end, which doubles as the battery bay cover. This twist switch, as well as the polycarbonate housing and O-ring seals, make the Krill lamps waterproof to 150 feet. This means they can be used by most of the world's divers. Recreational divers seldom venture below about 130 feet; even at that depth, if you're breathing air, you can only stay down for ten minutes before needing decompression on the way back up. The Krill lamps' solid construction also makes them considerably tougher than a chemical glowstick. They're not indestructible, but they're close enough for government work. On the down side, EL material's not very bright (I'll talk about brightness shortly), and it's got a life expectancy of only around three thousand hours. That's four months of constant on-time, so EL's perfectly fine for occasional use; EL material also doesn't instantly die at the end of its life, but just gets dimmer and dimmer. Still, don't expect to be able to hang a Krill light out on your porch every night and have it be useful for more than a couple of years. The EL material's powered by an inverter, at medium-high voltage but very low current. Like many EL devices, the Krill lamps flicker very slightly - you'll only notice it if you wave them around and look closely - and produce a small amount of radio frequency interference. Put a Krill lamp right next to a working AM radio and there'll probably be a big buzz; two or more sticks in close proximity to the radio will make a noise like very large flies having an argument. This isn't a big deal, though. About one foot of separation between the radio and the Krill sticks is enough to get rid of the interference. With two alkaline batteries, the Krill lights weigh about 75 grams (about 25 grams less, if you use lithium AAs). This is a lot more than a glowstick, but a Krill light or two still won't make much impact on the weight of a backpack. Here in Australia, Flexi-Glow Lighting are selling Krill lamps for $AU49 plus delivery - the blue ones are on special for $AU44, as I write this. There's a newer Krill model with an LED light in the end of the unit, now (the LED and the EL turn on at the same time); that's going for less than $US25, if you shop around. 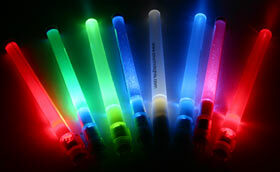 For comparison, Jaycar sell six inch glowsticks for $AU2.50 each (less, in quantity); you can probably find them for less. The cheapest "rave quality" glowsticks sell in the States for well under one US dollar each, in quantity. I've reviewed gear from PsychoLights before (here and here). Psycho-Sticks are their latest product. They're a cheap and cheerful take on the electronic glowstick idea. Instead of using a true area emitter light source, the Psycho-Sticks just put a high intensity LED at the end of a diffuser tube which gives somewhat even output. You turn them on and off by turning the end; it's not a tighten-it-down switch, but a freely rotating clicky arrangement reminiscent of turn-to-extend ballpoint pens. The switches are cheap and cheesy, and you may need to fiddle with them a bit to get them to work after changing the batteries, but all of the Psycho-Sticks I got for review behaved themselves well enough. ...a rather fabulous twinkle effect. I don't know whether it's possible to order twinkly Sticks (or non-twinkly ones) specifically; I'm checking. The only officially available colours are white, blue, green and red, with a warning that "intensity and color shades may vary slightly between units". The twinkle liners are a pretty dramatic variation, if you ask me. ...revealing the lamp unit, which has a normal directional LED beam. The little side-clip on the Psycho-Sticks is part of the lamp assembly, so you can still clip a tubeless Stick to your pocket, or suspenders, or G-string, or whatever. If you've got more than one Psycho-Stick, you can mix and match tubes between them. The colour of the LED that comes with a Stick doesn't necessarily match the colour of its tube; the really bright Sticks all seem to have super-high-intensity blue LEDs no matter what their stick colour. 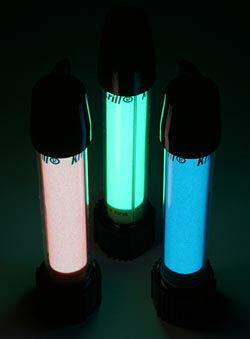 I got twinkly Sticks with blue, pink and green tubes that all had a blue LED, and a red-tubed one with a red LED. I also got blue and blue-green non-twinkly Sticks with blue LEDs, a white-tubed one with a white LED, and a red-tubed one with a red LED. Red tubes on blue LEDs aren't exactly the illuminative discovery of the century, but blue LEDs work well with the white tube. Better than the standard white LED, actually; it's a rather underwhelming unit. White LEDs are always dimmer than blue, all other things being equal, because white LEDs are blue LEDs with a multi-wavelength phosphor layer on top of them to provide the other colours. This one's particularly unexciting, though. All of the other Psycho-Sticks are respectably bright, though; more on that in a moment. And you really can't complain, for the money. If you buy one to four Psycho-Sticks, they're $US3.75 each plus shipping. The price drops with quantity, down to only $US2.25 if you're buying more than 50 Sticks. All this may tip you off to the fact that the Psycho-Sticks aren't aimed at quite the same market sector as the Krill lights. The Psycho-Sticks are much more cheaply made. They're about as shockproof as a five dollar Rolex, and they're waterproof to approximately minus twenty feet. But c'mon, look at the price. And they're not completely flimsy; they survived being tossed around my office and whanged off the doors and walls. And they'd probably survive being used in the rain, too. The batteries are replaceable, too. The ends of the Psycho-Sticks unscrew, and then you can tap out the cells. All of the Sticks except the red-LED models run from three LR44 alkaline cells (also known as G13, WL-14, 357, among other names); the red ones run from only two, and have a spacer in place of the third. In a pinch, you could use SR44 silver oxide cells, which're the same size, last a long time on the shelf, and have a higher rated capacity. Silver oxide cells can't deliver as much current as alkaline, though, and a single LED is a pretty hefty load for tiny-cells. So there probably won't be much run time difference between SR44s and LR44s. LR44s have around 100 to 120 milliamp-hour (mAh) capacity, which is pretty huge by tiny-cell standards. 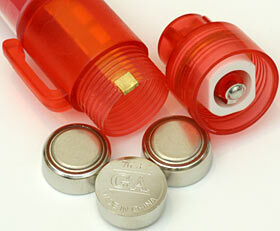 The nominal capacity of SR44s is close to 200mAh, but they won't manage that when powering an LED. The Psycho-Sticks weigh between 15 and 17 grams, depending on whether they're a two-cell or three-cell model, and on what kind of tube they have. The Krill lamps I got for review are the regular "120 hour" models, which aren't as bright as the "Extreme" models, but which have longer battery life. Through my multimeter (which adds some resistance to the circuit and slightly reduces current flow) the Krill lamps all drew about 28 milliamps (mA) from two fresh alkalines. This means a peak genuine draw of not a lot more than 30mA, and that draw will fall as the batteries get used up and their voltage slides down. The Krill lights, like LED lights, can use the batteries pretty much to the bitter end; they lit up at better-than-nothing brightness even when I removed one of their AAs. Then, they drew about 15mA. Even if the draw stayed steady at 30mA for the whole life of the batteries, these Krills would have no trouble getting eighty hours of life from a set of normal alkaline AAs. Quality alkalines could manage 90 or 100 hours. Since the current draw falls as the battery potential falls, 120 hours is a conservative estimate for the useful battery life of these things. They will, to coin a phrase, keep on keeping on. The Krill lamps are, however, no brighter than a regular long-life ("twelve hour") glowstick, at room temperature. They'll be a lot brighter at low temperatures - even at several degrees above freezing, chemical glowsticks dim considerably, while alkaline batteries can still supply the modest demands of the Krill lights with no trouble. If you want a glowstick that'll work when it's really cold, a Krill light kitted out with lithium AA cells should be good for forty below (Celsius or Fahrenheit - minus forty is where the scales cross over). 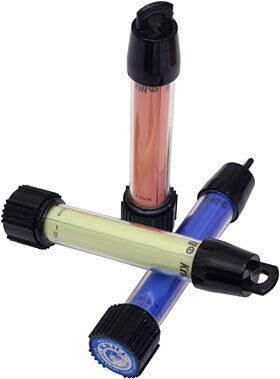 There's no way to boost the brightness of the Krill sticks; they'll be a bit brighter if you run them from lithium AAs (which have an open circuit voltage of 1.7 volts, versus 1.5 volts for alkalines), but they'll still lose by miles to a 30 minute or ultra-bright five minute glowstick. The Krill lamps' low brightness is not as much of a problem as you might think, though. Sure, they're no use for lighting up a football field, but it's surprising how little light you need for many tasks. Once your eyes have adjusted to the dark, you should be able to read quite easily by the light of a Krill lamp. Measuring the current draw of the Psycho-Sticks revealed that they're hitting their little batteries pretty hard. They share this quality with all tiny LED lights, which often rely on nothing but their batteries' internal resistance to limit the current to their LED. 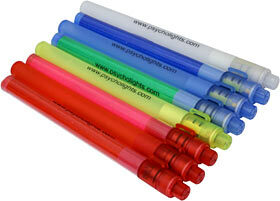 The blue-LED Psycho-Sticks all drew more than 50mA from three fresh LR44s. 50mA is a quite high current to run a 5mm LED with no heat sink to speak of, but these LEDs should still survive for many thousands of hours, if not tens of thousands. Something else in a Psycho-Stick is pretty much certain to break first. The white-LED Psycho-Stick drew an imposing 70mA (all that, and still rather dim...), but it was topped by the red-LED Sticks, which despite running from only two cells, pushed about 75mA through their lower voltage LEDs. I've seen LED lights that drive their lamps harder than this, but not much harder. Still, it doesn't matter much; the Psycho-Sticks aren't built to last, and the LEDs will be drawing a lot less than their initial current for most of the battery life. The Psycho-Sticks, with fresh batteries, were embarrassingly brighter than the Krill lamps. Even the dimmest of the Sticks - the white one - easily beat the brightest of the Krills for side-radiated light. And that wasn't even counting its forward flashlight beam. ...as this shot, set to correctly expose the Krill lamp, shows. My light meter's calibrated to measure white light, and will produce unpredictable results on other colours, but you can still use it to compare similar coloured lights. I found I could move the sensor 70 centimetres away from the brightest of the Krill lamps before the reading dropped below the one lux mark. When I tried the same test on the blue-green Psycho-Stick, I found it could be about twice as far away (and not pointing its flashlight beam at the sensor, either) and score the same. This means the Psycho-Stick's about four times as bright as the much more expensive Krill. But, of course, it won't stay that way. The Psycho-Sticks all draw more power from their tiny batteries than the Krills draw from their AAs, and those little LR44s have a lot less power to give. The total available energy of three LR44 cells, even into a very light load, is well under a tenth of the energy in two AAs. So, like all other tiny-batteried LED lights, the Psycho-Sticks will only be really impressively bright for an hour, at best, while the Krills will manage pretty much full brightness for three straight days with no trouble. The Psycho-Sticks still compare well with eight and twelve hour chemical glowsticks - they should still give you a glimmer of light after more than three days of on-time. But they're not at all in the Krills' league for duration. These products are good in different ways. The Krill lights are real glowstick replacements. They're tough, reliable, pretty dim area lights, useful for emergency lighting, marking the locations of people and things, and almost all of the other serious glowstick applications, except the ones that require you to toss your glowstick somewhere and never pick it up again. The Krills are heavier than glowsticks, and could conceivably be an ignition source; if something manages to smash them open, the batteries could spark. Glowsticks can't ever make a spark, so they're the light you want to use if you're wading through a pool of petrol. 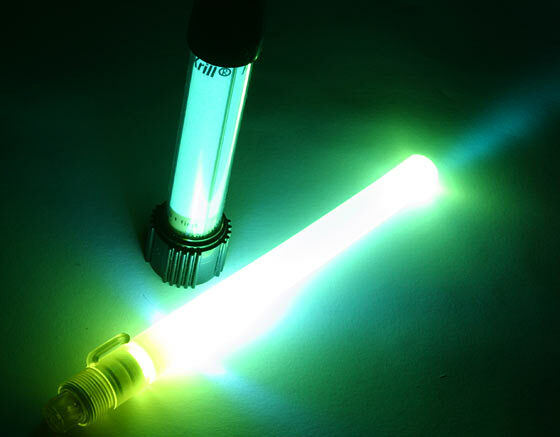 On the other hand, a chemical glowstick can't have a flat battery, but it can be dead on arrival. 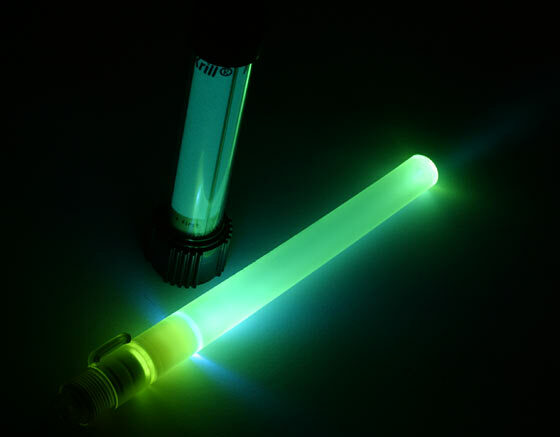 If the airtight packaging got punctured a month ago, your glowstick will be dead as a rock unless the humidity's been pretty close to zero. You can store your Krill lamps in a bucket of beer, if you want. They won't care. So, for what you get, the Krill lamps are a good deal. They don't have a lot of toy value, and they can't fill all of the many roles of chemiluminescent material. 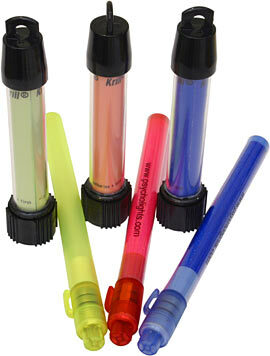 But people who go through a lot of glowsticks can, as Kriana point out, save quite big bucks by switching to Krills. The Psycho-Sticks, in contrast, are basically a cheap knockoff of the modular LazerBrite combination flashlight and glowstick, one of which I hope to scam for free review in the near future. If you trust your life to a Psycho-Stick, you are out of your mind. If you throw one into your camping, caving or mountaineering bag along with all of your other gear and at least one really dependable emergency light, though, you're not. The Psycho-Sticks are light, they're dirt cheap, they're fun, and they're quite likely to work when you need them to. They're meant to be cheap semi-disposable rave toys, but they're better than you'd expect. The fact that you can convert the Psycho-Sticks into a flashlight with a twist and a pull pushes them into the "Recommended" category, for me. I can recommend the Krill Electronic Lightsticks as well, though. It's just that they look a bit staid and fuddy-duddy next to all those disreputable, cut-price Psychos. Review Krill Electronic Lightsticks kindly provided by Flexi-Glow Lighting. Review Psycho-Sticks kindly provided by PsychoLights. The Glo-Toob is smaller than a Krill stick, but much brighter! You can find more of my reviews and tutorials about Things That Glow In Or On PCs here, here, here, here, here, here and here.